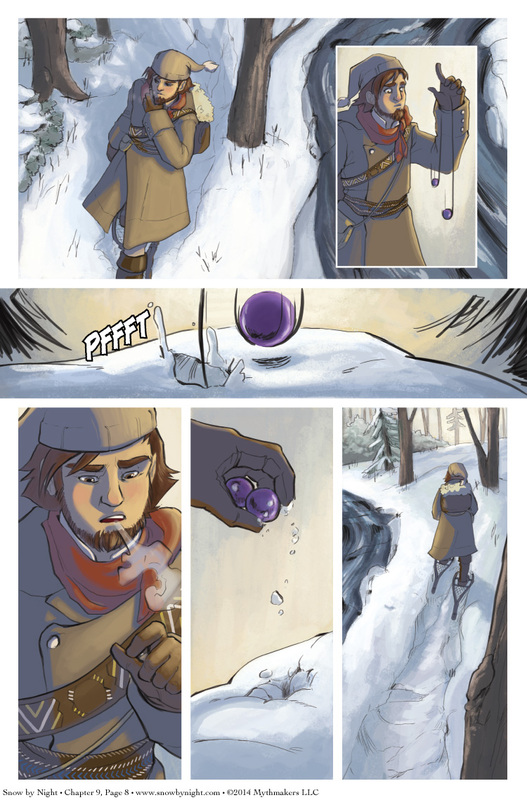 Blaise heads deeper into the wilderness on Chapter 9 Page 8. His efforts to revive Snow-by-Night continue to come to naught. To see what awaits Blaise in the coming night, please vote for Snow by Night on Top Web Comics. Diane and I will be at GenCon this weekend. You can find me at Author’s Avenue in the Exhibit Hall. Diane will be volunteering at True Dungeon. No almanac update this Friday because of GenCon. And on a final note, I uploaded pictures from Otakon to the Snow by Night Facebook page. *EDIT 8/17* We’re on the road and not able to do the update tonight. Expect Page 9 late tomorrow afternoon. Until then, please enjoy our Gencon photo album on our Facebook page. She must have been heavily drained if she can’t manifest at all. Hope he can get her some place safe where she can regain her energy. Unless he has to sacrifice some of his own essence for her benefit. Perhaps his ‘heart”? In folk tale tradition it is handy to accept the assistance of an animal helper. This may be Snow By Night’s father sending help.